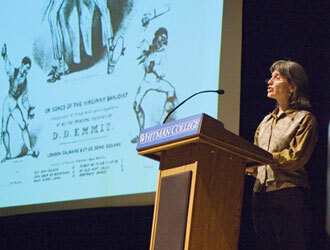 WALLA WALLA — More than 1,000 Whitman students, faculty and staff gathered Thursday in Cordiner Hall and in smaller classroom sessions throughout the day to participate in a symposium on race relations and community at the college. “(Today) represents an unprecedented opportunity to learn more about race and race relations not only at Whitman but also in the larger community,” Bridges said in his opening remarks. The symposium was organized in the wake of e-mail communication triggered by a student theme party for which two Whitman students painted themselves with black paint to mimic the cast of the reality TV series “Survivor: Cook Islands.” The episode sparked a large, sometimes vitriolic discussion on the Internet. The Whitman community — students, faculty and administration — responded with a call for a full symposium to address the issue of race from a broad perspective through critical thought and mindful communication. The morning plenary session featured five faculty presentations and several testimonials from students. In the afternoon, more than two dozen discussion sessions were held in classrooms across campus. Between the faculty presentations, Whitman students shared personal experiences involving race that have affected their lives. The large audience at Cordiner saluted them with a standing ovation at the end of the plenary session. “What I most hope is that the day has given us the ideas and tools for a conversation — a conversation that continues for a long time,” said Lerman.